Did you know that there are fish living in the Australian desert? Obviously, fish need water, and that’s usually scarce in the desert. However large parts of arid Australia sit over the Great Artesian Basin, which is an area where groundwater is under such pressure that if you dig a well, it’ll come to the surface all by itself… no pumping required! This is good news for fish, because weak points in the aquifer mean that water seeps to the surface and forms permanent springs in the desert. Because these springs are so isolated from other sources of fish, unique species have evolved that live only in spring complexes. One of the best looking of these fish is the red-finned blue eye, Scaturiginichthys vermeilipinnis, which lives only in springs on a single property in central western Queensland, Edgbaston Reserve. I was lucky enough to visit Edgbaston at Easter to see the red-finned blue-eye and help out some of the biologists working there—check out Renee’s blog if you’d like to see some great photos and learn more about the springs from someone who knows them really well. Unfortunately for the red-finned blue-eye, an alien invader, the mosquitofish Gambusia holbrooki has found its way to Edgbaston’s springs. Mosquitofish are an environmental pest species from North America, and one of the worst invasive fish in the world. We think they spread during floods, but however they got there, they’re bad news for the red-finned blue-eye. Wherever mosquitofish shows up in a spring, red-finned blue-eye disappear a short time later. Biologists are working to stop the spread of mosquitofish and protect the red-finned blue-eye, but since the species was only discovered in the early 1990s, we don’t know much about its biology. 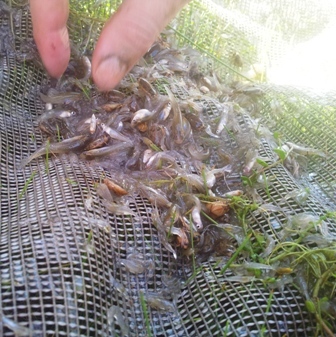 A typical net drag through a bore drain at Edgbaston: there’s no shortage of mosquitofish! However, the mosquitofish hasn’t gotten everywhere; for some reason it’s only found in some of the springs. 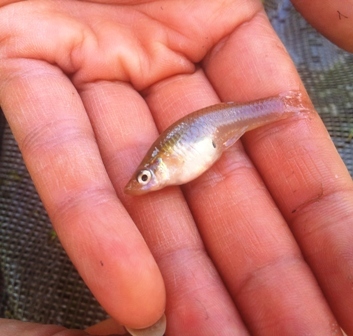 What makes a spring good habitat for red-finned blue-eye, and bad for mosquitofish? We’ve got a number of guesses: perhaps the red-finned blue-eye survives in the higher altitude springs because they don’t flood as much? Perhaps the most isolated springs are the best habitat because they’re harder for the mosquitofish to reach? Maybe the bigger springs are better for mosquitofish, or for red-finned blue-eye? There are a lot of hypotheses, and in my most recent paper, we set out to test some of these with occupancy models. We found that there’s some support for the hypothesis favoured by the fish biologists, which is that the high elevation springs are the best red-finned blue-eye habitat. Big springs were good for both species. Using our models we can estimate the probability that a spring will be occupied by both species of fish. This is good news for managers of the springs because it helps to decide where to re-introduce red-finned blue-eye and eradicate mosquitofish. However the physical factors that we tested explained only a part of the pattern in fish occupancy. We think that the biological characteristics of the springs (e.g. water quality, vegetation composition and extent etc) probably explains a lot more of the variance, so when that data becomes available, perhaps we can get a really great model to save the red-finned blue-eye!